Here are some frequently asked questions about Derma GeL®. How does Derma GeL® work? How long has Derma GeL® been available? What type of wound is Derma GeL® useful for? Should I wash the wound before applying Derma GeL®? When will the wound be healed? Will there be hair discoloration or excessive tissue granulation? How much Derma GeL® will I need? How often should I apply Derma GeL®? How do I store Derma GeL® once the pack is opened? Can it be used on exotic species such as birds, reptiles, etc? Is there any risk if the animal licks the Derma GeL®? Is Derma GeL® safe to use in competition, during gestation or with homeopathic remedies? Q: How does Derma GeL® work? A: Derma GeL® is a hydrogel that can provide and maintain a moist wound environment. By increasing moisture content, hydrogels have the ability to help cleanse and debride necrotic tissue and, if bandages are used, allow them to be removed without trauma to the healing wound. Derma GeL® also works by providing a protective film which prevents the wound from drying out and also allows for the cells within the skin to move freely as they work on the healing process. Q: How long has Derma GeL® been available? A: Derma GeL® was first launched in 1995 in the UK and in 2000 in North America. Q: What type of wound is Derma GeL® useful for? A: Horses: Some examples include wire cuts, bites, scrapes, skin loss following a trauma, surgical wounds where closure was not possible. Call your veterinarian immediately if the wound is very deep or is a puncture, looks too large for the sides of the wound to touch (and will probably need stitches), or it is near a tendon, ligament, or joint. Also, call your veterinarian if there is spurting blood or blood flow that you cannot stop within a minute or two. A: Dogs and Cats: Some examples include wounds following trauma, bites, skin loss, surgical wound where closure was not possible. NOTE: Unless the wound is very superficial, dogs, cats and other pets should always be taken to a veterinarian for evaluation and treatment. Q: Should I wash the wound before applying Derma GeL®? A: Horses: The ideal method is to use sterile saline, but using generous amounts of water alone is of great benefit. If using a hose, play the water at an angle to the wound and do not use high pressure. A: Dogs and Cats: Washing the wound very carefully before taking the animal to the veterinarian is of benefit, however, do not lose time in getting to the veterinarian's clinic. Q: What about using bandages? A: Depending on the severity and location of the wound, a bandage may or may not be necessary. Some wounds are just impossible to bandage, especially on horses, due to their size and location, e.g., on a joint. However, if bandages are used, Derma GeL® will help prevent the bandage from sticking to the healing skin and causing pain and further trauma when the dressing is changed. Q: When will the wound be healed? A: This depends on the severity of the wound. A superficial scrape my take only a few days, but a severe wound where a veterinarian has initially treated the wound and has recommended a management/treatment plan, may take weeks or months. Experience has shown that wounds treated with Derma GeL® will heal faster and with less scarring than if they are left untreated or if antiseptic sprays and ointments only are used. Q: Will there be hair discoloration or excessive tissue granulation? A: As long as used as recommended and because Derma GeL® is certified non-mutagenic, wounds are recovered by cells genetically identical to the cells initially available (no excessive tissue granulation or hair discoloration on regrowth). Q: Will there be scarring? A: This depends upon the severity of the wound, but using Derma GeL® should help reduce scarring. Q: How much Derma GeL® will I need? A: This depends on the size, location, and severity of the wound. The 10 mL"Tear N'Tuck" tube is ideal for a first-aid kit and the 100 mL is the more economical size for larger wounds or those that may take several weeks to heal. Q: How often should I apply Derma GeL®? A: Depending on the location and severity of the wound, you may need to apply Derma GeL® two or three times a day. Your veterinarian can advise you on a wound management plan. Follow his/her directions. Q: How do I store Derma GeL® once the pack is opened? A: Room temperature is advised and refrigeration is not needed. Q: Can it be used on exotic species such as birds, reptiles, etc? A: This will require consultation with your veterinarian, but Derma GeL® has been used successfully in zoos on birds and exotic animals under the supervision of a veterinarian. Q: Is there any risk if the animal licks the Derma GeL®? A: No, the product is made from all-natural ingredients and is safe should the animal lick the wound site. Q: Is Derma GeL® safe to use in competition, during gestation or with homeopathic remedies? A: Yes. 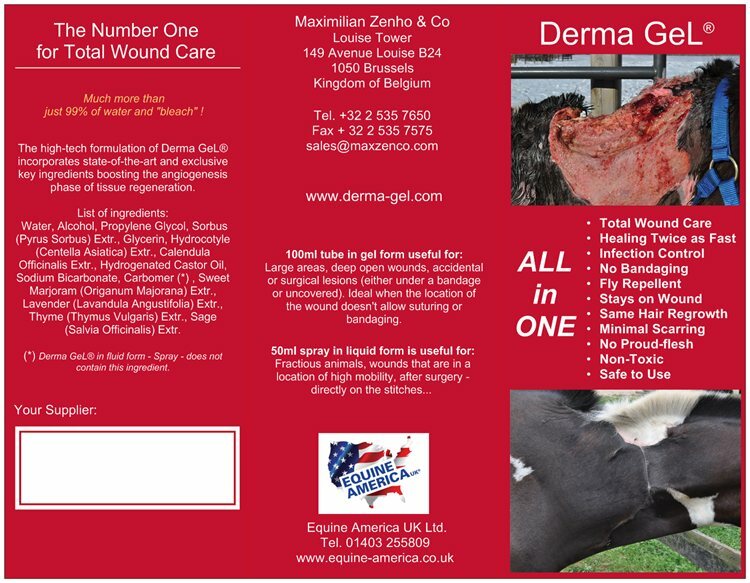 Derma GeL® is devoid of prohibited or toxic substances and therefore safe to use in competition or during gestation. Besides, Derma GeL® is compatible with homeopathic remedies and it does not contain steroids. Q: Is Derma GeL® expensive? A: Derma GeL® is inexpensive because it combines: bacteriostatic properties, moist environment, soothing effect, healing process enhancers, insect repellent feature and a protective layer (no secondary dressing or bandage required). The unrivaled efficacy of this combination reduces drastically the healing time; leading to fewer product applications.